Register MeasureSquare ID – Measure Square Corp. This is how you register a MeasureSquare ID after you have initially installed MeasureSquare 8. 1. 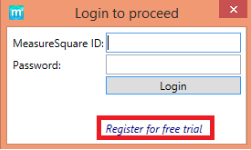 Open MeasureSquare program and click Register for free trial to create a M2 ID and password. 2. 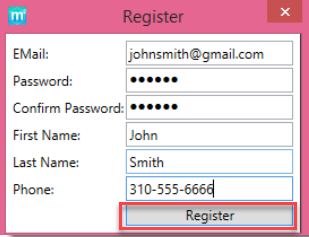 Enter a valid email address and contact information. Click Register. 3. After signing up, check your email and proceed to activate your M2 ID by clicking the activation link from the confirmation email sent to your registered email address. 4. After activation is completed, open MeasureSquare program again, sign in with your M2 ID (email used to register) and password, and click Login button.